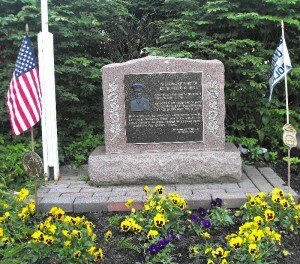 This monument for Lieutenant Don Hill is located outside the police department. Monday night, the Common Council approved dedicating Civic Plaza in honor of the police officer who was killed in the line of duty Nov. 11, 1995. OSWEGO, NY – At Monday night’s meeting, the Common Council honored a veteran Oswego police officer who died in the line of duty. Lieutenant Don Hill had served Oswego as a police officer for more than 20 years. He was struck and killed by a vehicle while directing traffic on Nov. 11, 1995. The Lake City Police Club requested that the city dedicate the Civic Plaza as the “Donald R. Hill Plaza” to honor him on the 20th anniversary of his passing. Members of the club will volunteer their time in maintaining the plaza. Hill was the second Oswego police officer to die in the line of duty. The first was a motorcycle officer killed in a crash in the 1930s. Approved use of public space by the Tree Stewards in order to plant 50 White Oak trees. The stewards will plant the trees this month in various locations around the city. Councilors authorized acceptance of the donation of smoke and carbon monoxide detectors and the subsequent installation in residences by the Oswego Fire Department. Power New York Hydro Services for the operation and maintenance of the High Dam Hydroelectric Facility. The current pact expires on Dec. 31. The new deal will run from Jan. 1, 2016, through Dec. 31, 2018. The mayor was also authorized to execute a one-year extension of the agreement with Butler Disposal Systems for the transportation and disposal of sludge. The extension is under the same provisions as the initial terms of the deal. The council referred Wireless Communication Facilities’ (Verizon) application to the Planning Board for its advisory opinion. The company seeks to operate a wireless facility on the roof of an existing building at 132 Ellen St.
Two requests to transfer funds were approved. One was within the Department of Public Works and the other within the Fire Department. The fire chief’s request to purchase a new vehicle for use by the department was OK’d. Then, the councilors waived the rules of the Common Council to present two resolution from the floor without committee consideration. The council approved the proposal submitted by ThyssenKrupp Elevator Corporation for repairs to the elevator at the Eastside Wastewater Treatment Plant and further authorized the transfer of funds ($7,734.94) to pay for same. And they approved use of public space by the SPCA, in order to place advertising signs for the upcoming Howliday Fundraiser. The event is slated for Nov. 15. Signs will be placed at East 12th and Bridge streets, Burkle Street and Route 481, West Utica and First streets, and West Seneca Street and Washington Boulevard.